Ever heard of The Compozers? Common Sense tells me that you have! I had the pleasure of interviewing the drummer of the band, Stephen, to gain an insight into his journey with The Compozers, as well as a number of other ventures he is currently pursuing. S: My name is Stephen Asamoah-Duah. I play drums in the band, Compozers, I run a company called Future Music Services and I engage in a few other ventures that I am keeping under wraps at the moment. JF: Tell us a little bit about your journey thus far. S: In life, you have two types of people - those that pursue the conventional route through academics and those that don't necessarily abide by that and make their own rules and do their own thing. I would categorise myself as the latter as from a young age, I knew exactly what I wanted to do and venture into the world of entrepreneurship and business. With regards to The Compozers, I officially joined as soon as I left school in Year 11, having played with them before on a number of occasions. Around this time, I had already gained some local and national recognition as a drummer having won 'Young Drummer of the Year, 2011'. 4 years on, we are where we are today - 7 sold-out headline shows across the UK, shows in other parts of the world, and worked with an endless list of amazing artists. I can only attribute that to the blessings of God and our faith in doing what we are doing. JF: That's amazing. As a band, The Compozers are doing some fantastic things in the scene right now and I am glad to see that your hard work as a collective, is paying off. You mentioned that you were very interested in business. How did you further your knowledge in this area before taking the plunge to start your own business? S: I decided to do a BTEC in Business in college, which allowed me to balance my time between studies and playing gigs. Around this time, I began doing a lot of my own personal research into some extremely successful business owners, learning from their journeys and mistakes as well as connecting with a number of accessible business owners here in the UK. Ideas tend to come to me in three settings - when I am in the gym, on the toilet, or in the shower. I had a light-bulb moment one day, (I can't remember which one of the three I was doing - laughs!) and thought, I would love to open up a music school in the future that provided music tuition for a variety of instruments, as well as provide instrument services to clients. One thing I am extremely passionate about is giving back and helping people secure opportunities. I literally had this idea around 2 years ago and in that time, sought advice from a number of people I look up to and began structuring my business model with my passion at the forefront of it all. Future Music Services was launched and our focus is providing the next generation with the necessary skills and ability to excel within music. We currently provide music tuition, instrument hire and talent management services. Having had experience in all 3 in my career in music thus far, it made sense to combine my knowledge with my passion and service the market as a whole. JF: I noticed pretty early on that you were passionate about giving back to the community as a whole and commend you for your efforts and contribution to the academic institutions in your surrounding area. As 2017 is coming to an end, what has been your biggest lesson thus far? S: Probably sounds very cliché, but it always starts with that first step. A lot of people talk about their ideas and sit on them, but taking the first step is essential and it is so encouraging seeing your ideas come to fruition. I remember when I first started Future Music Services, I was dead keen on having a place of business but I just put my faith in God, took the plunge and it began to unfold organically. I signed up to so many waiting lists for spaces that I could use as the home of Future Music Services and low and behold, I got a call one day - the space I actually wanted, good location. I signed the lease and got the ball rolling. I had the property now and all I was given were the four walls - I had to do it up and make it suitable for lessons and consultations. I have a friend that currently works in construction - he hit me up and offered to help me out at a discounted price. I remember seeing your logo and you pointed me in the direction of Miss Tolu DK. I hit her up and she really got my logo done to a T! There were months where I didn't have as much business as I would like and I was worried about how I would pay the rent but somehow, something would happen and God would come all the way through for me. My lesson and encouragement to everyone is to take that first step and have faith because things definitely work out in the end! JF: In your journey being with The Compozers and in your personal ventures, with Future Music Services being one of them, tell us about a particular challenge you have faced?. S: One challenge? People, you know! Throughout the whole process in your career or even in business, you expect people closest to you to do things for you without you having to say and in a lot of situations, it has rather been those who are not as close to me fighting my corner. One thing my parents taught me from a young age was not to rely on people. My journey has encouraged me to celebrate the amazing people that I have around me and to also reciprocate that back to them. I have some amazing friends, particularly those that I went to school with and they have all been so helpful to me in starting my business and went the extra mile. I always say that I would love to work with my friends and I cannot wait to provide them with opportunities in my business. God has placed certain people in my life for various reasons and I am forever grateful. JF: As humans, we are indeed relational creatures and we weren't designed to exist on our own. In this entrepreneurial space, it can be disheartening when people that you expect to support you don't or even when people try to take advantage of you, however it is essential to focus on the positives and celebrate the amazing people you have around you that genuinely care for your well-being. With that being said, who inspires you when it comes to business? S: Business-wise, there are three people that I really look up to: Diddy (definitely due to have lunch with him sometime in the foreseeable future! ), Tinie Tempah and Dumi Oburota, Tinie's manager. Their stories aren't really any different from mine - their drive to work hard and constant desire to level up is something that I resonate with. More closer to home, I have an amazing friend Rodney Wilson, who is an investment broker and a super entrepreneur - someone that I really look up to. He took his time with me and showed me several things and gave me some amazing advice.Another friend and inspiration is Solomon Yusuf - again, he took me under his wings when he really didn't have to and we speak at least once a week and have regular lunch meetings to discuss business and any issues that I may have. There are so many other people that I am inspired by but for the sake of our readers, I'll cut it short there. JF: Diddy is definitely one of my business inspirations - real life mogul! Finally, 2018. What does 2018 have in store for Mr Stephen Asamoah-Duah? S: I am forever trying to level up and setting even bigger targets. 2018 - in terms of music, The Compozers aim to step into a new space and release some original music, do more tours and shows and continue to collaborate with some amazing people in the industry. Personally, as a drummer, I am eager to interact with more drummers across the world and really just take my craft to the next level. Finally, on the business side of things, I have some 'passion plans' for Future Music Services that I cannot wait to push out and hey, a few more new ventures launching that you will be able to see if you keep up with me on social media. 2018 is looking great and I have faith that it will be a blessed year! I hope you enjoyed reading this as much as I did writing it. Stephen is an inspirational young man and his drive for success and desire to constantly do and be better motivates me. 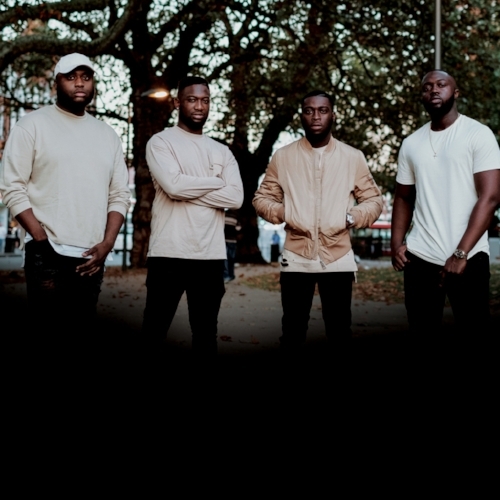 It's only right that I take this opportunity to big up The Compozers - 2017 has been an amazing year for them, particularly in the current UK music scene, having worked with the likes of J Hus and Not3s - well done guys - even bigger things to come in 2018 and beyond! In case you didn't know, 'A Night With the Compozers 5' is happening live and direct at The Roundhouse, London on Wednesday 20th December 2017. Tickets are flying, click here to get yours! You are in for a real treat, with the likes of Rachel Anson, DJ P Montana, Afro B, Hardy Caprio, One Acen (to name but a few) supporting on the night.